In both new and older homes, the best way to ensure that you are well informed about the strengths and weaknesses of a property is to have a professional home inspection. We are trained to identify problem areas both small and large that may have been overlooked by the previous owners, and to identify which require immediate attention. See our Inspection Overview for more details. Whether you are selling your home on your own or using a realtor, it’s always prudent to have a professional home inspection. Knowledge is power. All homes have strengths and weaknesses: we help you answer how serious the problems are and which must be immediately addressed, and which can wait. The more you know about your home, the more prepared you will be for negotiation. 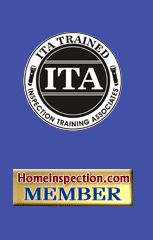 See our Inspection Overview for more details. In a new home, the quality of construction is often not what it used to be. Therefore many buyers have independent reviews of their properties during various stages of the construction process, including slab, frame, and final inspection. This relatively inexpensive inspection protects your purchase, prevents unpleasant surprises, and ensures the quality home that you’ve dreamed about. Most builders provide a one-year warranty for new construction. Generally during this period of time the buyer develops a "punch list" of corrections for the contractor to repair under the warranty coverage. Some defects will not be obvious to the untrained eye. It is prudent to obtain our home inspectors list of items that will most likely be repaired by your builder at no cost to you. You will be reassured knowing that potential problems were addressed before they grew into something that could cost thousands of dollars in future repairs. If the property you own or are purchasing has a pool or spa on the premises, a professional pool/spa inspection is a good choice to learn more about the condition of the pool/spa and to protect your investment. The pool and spa inspection will include an analysis of the exterior of the pool, the pool shell/coping, pool equipment including the heater, pump, filter, and electrical components. Our job as your professional home inspector is to alert you to every extent possible about unknown problems and potential environmental hazards in your current, or potential house. Our inspection is a non-invasive visual inspection of your property which can alert you to possible problems. See our Environmental Hazards page for more information.